This graph shows cycles of thermal conductivity when the proteinaceous film is wet and then dry. Image: Melik Demirel, Penn State. Tuning materials to possess optimal optical and electrical properties is becoming commonplace. 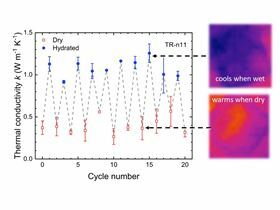 Now, researchers and manufacturers may also be able to tune materials for thermal conductivity by using a squid-inspired protein coded by a repeated sequence of DNA known as a tandem repeat. "Controlling thermal transport in modern technologies – refrigeration, data storage, electronics or textiles – is an unsolved problem," said Melik Demirel, professor of engineering science and mechanics and director of the Center for Research on Advanced Fiber Technologies at Penn State. "For example, most standard plastic materials have very low thermal conductivity and they are thermal insulators. These squid-based bio-materials that we are working on have low conductivity at ambient humidity, but they can be engineered so that their thermal conductivity increases dramatically." In this case, the increase is dependent on how many tandem repeats are in the DNA that codes for the protein and can be four and a half times larger than increases in thermal conductivity seen with conventional plastics. One potential use of this protein biofilm might be as a fabric coating, especially for athletic wear, said the researchers. The material could be perfectly comfortable and cozy in everyday use, but when engaged in energetic activity sweat produced by the wearer could ‘flip’ the thermal switch and allow the fabric to remove heat from the wearer's body. Demirel and his team have designed synthetic proteins based on tandem repeating sequences. They were able to choose the number of repeats they want and investigate how the resultant proteins react to stimuli such as moisture. "Under ambient conditions – less than 35% humidity – the thermal conductivity of these proteinaceous films do not depend on repeat units or molecular weight, and demonstrate similar thermal conductivities to disordered polymers and water-insoluble proteins," the researchers report in a paper in Nature Nanotechnology. When the films are engineered to have higher molecular topology, the thermal conductivity jumps when they become wetter, whether through high humidity, water or sweat. In collaboration with colleagues at the University of Virginia and the US National Institute of Standards and Technology, the researchers found that as the number of tandem repeats increased, the thermal conductivity did as well. "Because the thermal conductivity when wet is linearly related to the number of repeats, we can program the amount of thermal conductivity into the material," said Demirel. "So, we could make better thermal switches, regulators and diodes similar to high-performance devices to solve the problems in modern technologies such as refrigeration, data storage, electronics or textiles." Two-step thermal reduction process boosts conductivity and mobility of reduced graphene oxide (RGO), opening up new potential applications. Transparent thin film oxide semiconductor material has highest recorded conductivity for its class.